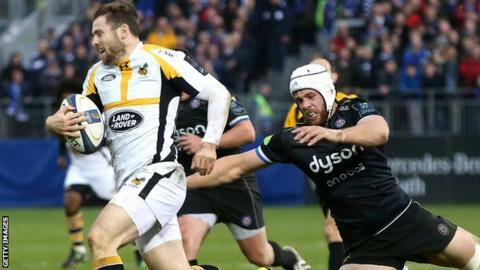 Wasps ended Bath's unbeaten run in the Champions Cup and opened up a six-point lead at the top of Pool Five. Semesa Rokoduguni put the hosts ahead early on at the Rec but Wasps hit back through Elliot Daly and Jimmy Gopperth - the fly-half adding five kicks from the tee. George Ford and Gopperth exchanged penalties in the second half, and Daly added a drop goal for the visitors. Alapati Leiua's converted try made sure of Wasps' convincing win. The two Premiership sides are vying for a quarter-final spot alongside reigning champions Toulon and three-time winners Leinster. Bath had kept up the chase in an open pool with a dramatic late victory over Wasps in the reverse fixture last weekend. But now the pressure is on the West Country side, with two games against Toulon to come as well as a trip to Dublin. Wasps travel to France in January before welcoming Leinster to Coventry. New Zealander Gopperth endured a difficult start to his Wasps career after serving a three-week suspension for a late challenge on Leicester captain Mathew Tait in their Premiership meeting in November. But the former Newcastle player starred for Dai Young's side at the Rec, scoring 23 points in their impressive victory. England's Rokoduguni got the hosts off to the best possible start, when he got on the end of a flat pass from Kyle Eastmond and was left in acres of space to race over. Wasps responded through a Gopperth penalty and took the lead when Joe Simpson picked up a loose ball in midfield and fed to Daly. Gopperth then added two more kicks and a converted try of his own following a five-metre scrum, as his side took a deserved 23-7 lead at the break. Bath managed to halt Wasps' flow in the second half after overhauling their front row, but they only managed to add three points from the boot of Ford. Daly slotted a speculative drop goal to extend the visitors' lead and, with Rokoduguni in the bin for a deliberate knock-on, Wasps pounced again. Gopperth broke through the defence and offloaded to Leiua, and the fly-half added a fourth conversion. Bath head coach Mike Ford: "It is an ugly period for us, but we will come out of it stronger. We will keep our chins up. We live to fight another day in this competition. "We are a bit fragile. To go from 7-0 up to 23-7 down is not great. Our scrum was a big problem, but there were other things as well. "We will be honest with ourselves on Monday morning. We will get a bit of flak, but it is what gets said inside that counts. We are in this together, and we will get through it." Wasps director of rugby Dai Young: "We couldn't have wished for much better today. "We were disappointed to lose last week, but in saying that we don't feel that we played well on that occasion. "This week there was a far better balance. It was a real composed performance, especially after going 7-0 down. "You don't come to Bath many times and get a good win. I am really pleased with the performance." Bath: Watson; Rokoduguni, Joseph, Eastmond, Banahan; Ford, Matawalu; Auterac, Batty, Wilson; Garvey, Attwood; Houston, Louw (c), Denton. Wasps: Miller; Halai, Daly, Jacobs, Piutau; Gopperth, Simpson; Mullan, Johnson, Cittadini; Launchbury, Davies; Haskell, Smith, Hughes. Replacements: Shervington for Johnson (53), McIntyre for Mullan (61), Gaskell for Davies (61), Leiua for Jacobs (61), Swainston for Cittadini (65), Jones for N. Hughes (65), Jackson for Daly (75), Robson for Piutau (75).